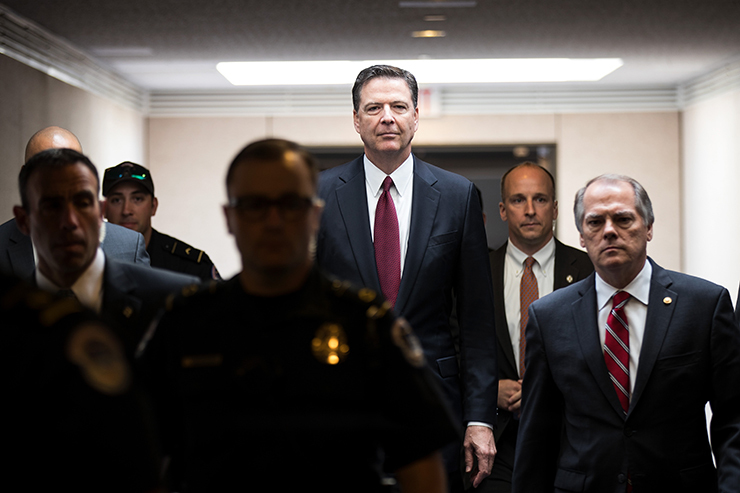 On December 7 after weeks of legal resistance, former FBI Director James Comey was forced to appear at a closed-door hearing convened by Republicans in the House of Representatives. The hearing was called to investigate political bias by Comey and other officials against then-candidate Donald Trump. In the last days the focus has begun to shift to the surprise of many to the Democratic Party DNC, to Hillary Clinton and James Comey. For almost two years the world has been inundated with select leaks and claims of Russian bias on behalf of Trump’s candidacy. We saw naming of a Justice Department Special Council to investigate and presentation of a dossier to the Democratic National Committee in 2015 from ex-British MI6 agent Christopher Steele of dubious quality. Now, in the wake of the November US mid-term elections where Republicans actually increased their Senate majority to 53-47, the focus is turning to Hillary Clinton, James Comey and to the controversial and highly-interesting Clinton Foundation. Without repeating the details here, the basic facts revolve around major mainstream media accusations of Trump obstruction of justice and wrongful dismissal of Comey in addition to Trump’s alleged Russian crimes that Special Counsel, ex-FBI head Robert Mueller, is supposedly investigating. For two years the public has been inundated with salacious details and leaks around those investigations against Trump and associates. Now, to the surprise of some, the spotlight seems to shift to misdeeds not of Trump but of Hillary Clinton, Comey and of the increasingly controversial Clinton Foundation. Recall that during the contentious 2016 US Presidential campaign pitting Clinton against Trump, it became known that as Secretary of State under Obama, Clinton had used a private e-mail server for her work as Secretary of State, violation of security laws and, according to a clear whitewash investigation by then FBI chief James Comey where, in July 2016, Comey declared that, “Although there is evidence of potential violations of the statutes regarding the handling of classified information, my judgment is that no reasonable prosecutor would bring such a case.” The final Comey declaration also chose to ignore critical issues as to how many contained secret or top secret classification. It later emerged that Comey had drafted his statement of Clinton’s exoneration almost two months before the investigation by the FBI ended. Keep in mind those emails also link to activities at the time of the Clinton Foundation run by husband Bill. Now US Federal District Judge Royce Lamberth has ordered the Hillary Clinton email case reopened. “At worst, career employees in the State and Justice departments colluded to scuttle public scrutiny of Clinton, skirt FOIA, and hoodwink this court,” Lamberth wrote. Republican Rep. Mark Meadows says the evidence against the Clinton Foundation is mounting. The North Carolina congressman is the chairman of the House Oversight Committee on Government Operations and is poised to examine the organization next week in hearings. Meadows told Fox News Thursday that hundreds of pages of evidence from witnesses have to be assessed, but that a cursory examination “raises grave concerns their operations were not above-board as the American people have been led to believe.” Meadows heads a special subcommittee that is to hear testimony on December 13 from John Huber, a special US Attorney named a year ago to investigate possible illegal activities around the Clinton Foundation when Hillary was Secretary of State. On December 7 The Hill online site reported that 6,000 pages of evidence that was attached to a whistleblower submission was filed secretly more than a year ago with the IRS and FBI by someone with inside knowledge of the Clinton Foundation. The documents reportedly reveal that the Clinton Foundation engaged in illegal activities and may be liable for millions of dollars in delinquent taxes and penalties. Huber is to testify on this and other findings his staff of some 470 attorneys have been accumulating since 2017. In this light, a news item from December 4, 2018 suggests that things could get very explosive around Clinton Foundation revelations. On that day US Attorney for the Southern District of New York, Geoffrey Berman, released a sealed indictment against a Panamanian law firm, Mossack Fonseca, on charges including “Conspiracy to Defraud the United States, Conspiracy to Commit Wire Fraud, Conspiracy to Commit Tax Evasion, Wire Fraud, and Money Laundering Conspiracy.” Mossack Fonseca attorney Ramses Owens, a 50-year-old from Panama, remains at large. Mossack Fonseca, was at the heart of the 2015 Wikileaks revelations of the so-called Panama Papers. It has several ties to the Clinton Foundation. They include Gabrielle Fialkoff, finance director for Hillary Clinton’s first US Senate campaign and today “senior adviser” to New York Mayor Bill de Blasio. Fialkoff has donated to the Clinton Foundation and to Hillary’s presidential campaign. It includes shady Canadian mining billionaire Frank Giustra, a business partner with Bill Clinton and board member of Clinton Foundation who is in the center of the soon-to-be infamous Uranium One affair. Guistra’s offshore company UrAsia Energy Ltd was in the Mossack Fonseca Panama Papers leak. Indications and investigations including court-ordered disclosues have shown evidence suggesting that while Hillary Clinton was Obama Secretary of State, she and husband Bill used the Clinton Foundation to solicit hundreds of millions of dollars in “charitable” donations from countries such as Saudi Arabia, Nigeria, Bahrain to the foundation in return for direct access to Secretary of State Clinton. At the time, Hillary Clinton’s State Department Chief of Staff Cheryl Mills also served on the board of the Clinton Foundation. Mills today is also listed on the foundation board. Now it so happens that James Comey has a brother, Peter Comey, who had an executive position with the Washington law firm that did the audit of the Clinton foundation in 2015. Peter Comey was officially DLA Piper “Senior Director of Real Estate Operations for the Americas,” in 2015 when the Clinton Foundation scandals first broke and Hillary was preparing her Presidential campaign. Not only was DLA Piper, the firm where Comey’s brother worked, involved in the audit of the Clinton Foundation. According to the foundation’s donor records, DLA Piper has given between $50,000 and $100,000 to the foundation. There are other “coincidences” such as James Comey’s role before becoming FBI head as Vice President for top defense contractor Lockheed Martin, which became a corporate donor to the Clinton Foundation. Peter Comey, working for the law firm that did the audit of the Clinton Foundation, at the time his brother headed the FBI and led the whitewash of Secretary of State Hillary Rodham Clinton matters a heck of a lot. Even the mere hint of such conflict of interest ought to have led to FBI director Comey recusing himself from any contact with the 2016 Clinton email server investigation. Now the emergence of a Clinton Foundation insider whistleblower working with the US Justice Department and the Huber investigation threatens to blow the lid off what increasingly looks like one of the most egregious centers of political corruption in Washington. It begins to become more clear why Hillary and friends used all influence in government and mainstream media to discredit the President and try to close all investigations that could put them in the docket. Now it gets interesting, as the signs are the Justice Department Clinton investigation is ready to be presented.